My Stolen Bike Was Found With Your Help, Thank You My Fellow Cyclists! Thank you so much for helping to find my stolen Ibis. I really, really can’t thank you enough. My husband and I have been having a tough time lately, and when I woke up Thursday morning and realized my bike was gone – I was pretty devastated. But I emailed every cycling group I knew, posted my story Twitter, Flickr, Facebook, Google+ and cycling forums, put up flyers and just hoped that it might come back to me. A part of me was resigned to my fate and had started the insurance claims process, especially after we came back empty-handed from making the rounds at two flea markets yesterday morning. But I received so many messages of support – I wish I could thank you all in person – that I wasn’t yet ready to consider it gone forever. So when Shawn got the call this morning that the Ibis had been found by Jillian Betterly, I was in serious shock. It only took four days to recover my bike. I’m lucky that the thieves were greedy enough to try and sell the bike locally. I’m also lucky that you helped spread the word about my bike so that it seemed like everyone in California and beyond knew about its disappearance. And I’m especially grateful that Jillian, who was also looking for a bike that had been stolen from her property*, was at Laney College this morning with a friend. Once she spotted the guy, she followed him quietly so as not to spook him. When he was ready to drop it off at a vendor, she showed him a photo of the Ibis and said it was stolen, then took it. I picked it up this morning from the downtown PUBLIC Bikes store in Oakland where she works. So thank you, my cycling community. I’ve already cried many tears of happiness this morning and really owe the return of my bike to you. I’m truly touched by everyone who helped my bike find its way home. If you can do me one more favor, please share this story. Over the past few days, I heard many sad stories of bikes being lost, seemingly forever, and then suddenly – they were found through the diligence of our community. We won this round, and if you’ve ever had a bike stolen – or ever have the misfortune of having one stolen – you may get it back because the cycling community is truly awesome. And we are united in our ongoing battle against the villainy of bike thievery. So thank you again – I will go on a bike ride today in your honor! 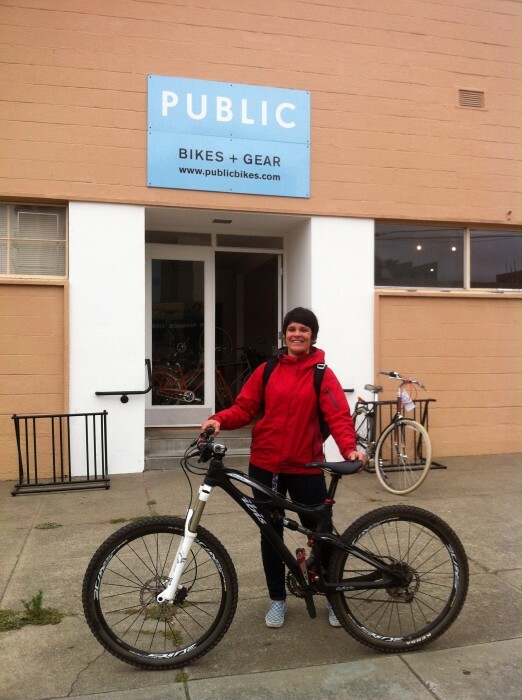 ****I asked Jillian if she needed help finding her stolen bike, but she declined – it’s a long story.